The Poolside Organizer with Hamper keeps your pool area from becoming littered with floats, toys, balls and towels. It is made out of non-corroding PVC and assembles in minutes. Caddy keeps rafts and floats organized as well as balls, swim masks, and towels with its built in hamper and towel bar. This rugged 16-gauge vinyl Above Ground Pool Air Pillow absorbs freezing waters pressure and helps protect your pool walls. The Air Pillow also reduces excess rain, snow, and leaves on your winter cover. Simply inflate and place in center of pool under cover. Available in 3 sizes: 4-ft x 4-ft, 4-ft x 8-ft, 4-ft x 15-ft. 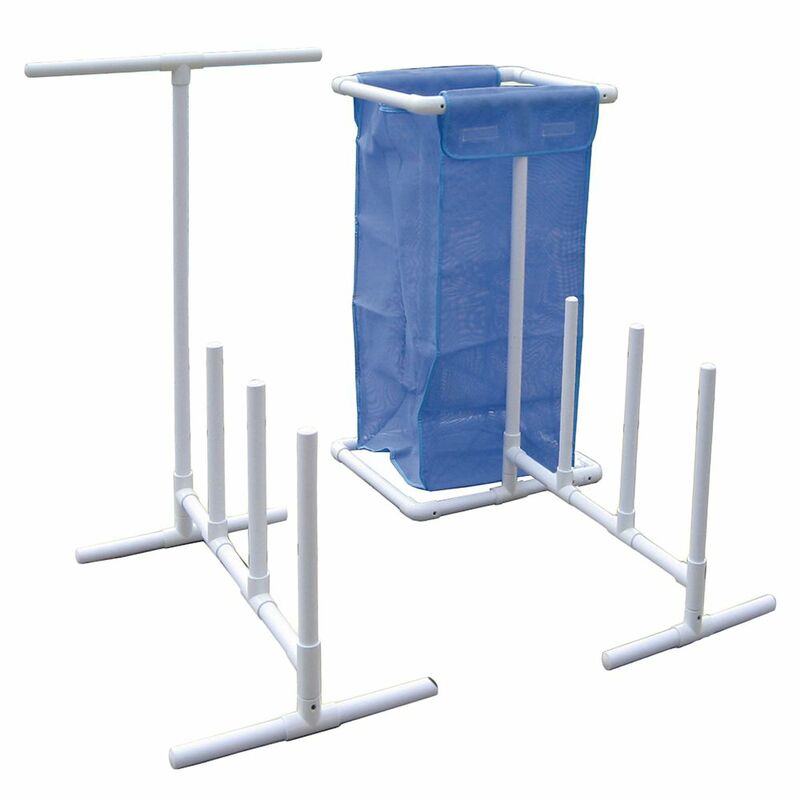 Pool Side Organizer The Poolside Organizer with Hamper keeps your pool area from becoming littered with floats, toys, balls and towels. It is made out of non-corroding PVC and assembles in minutes. Caddy keeps rafts and floats organized as well as balls, swim masks, and towels with its built in hamper and towel bar. Pool Side Organizer is rated 2.7 out of 5 by 3. Rated 3 out of 5 by Linda from We expected this to be white, but it was lavender! Very weird. I'm hoping it will bleach out a bi... We expected this to be white, but it was lavender! Very weird. I'm hoping it will bleach out a bit in the sun because it's too much trouble to return. Otherwise, it's absolutely fine. Parts went together easily--even before we found the instructions tucked into the mesh bag. Rated 4 out of 5 by Anonymous from Great Organizer!! This organizer has almost everything I need to organize the rafts & toys. All it needs it maybe one more slot for the rafts & a bigger toy/netted bin. Rated 1 out of 5 by LM1968 from Flimsy I was very disappointed with this product and did return it. It was very flimsy and since it is 2 separate pieces it was just a pain to try and keep them together when placing long floats etc. Do not waste your money or time.